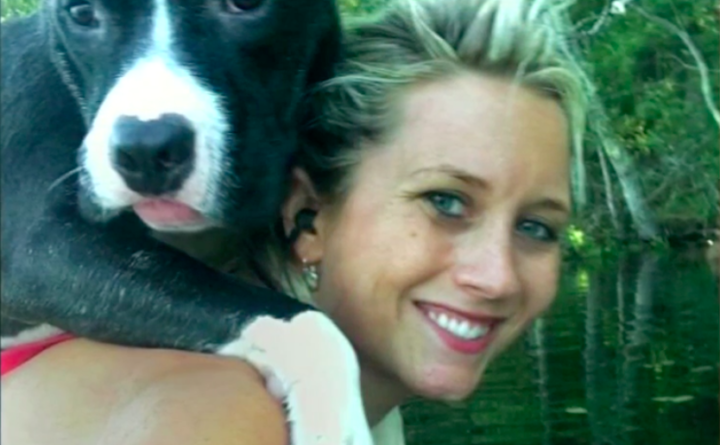 Kristen McKellar is pictured here with her dog. She was hit by a boat in Damariscotta Lake and died in August 2018. A Massachusetts man pleaded not guilty to manslaughter and other charges in connection with a Camden woman’s death on Damariscotta Lake in Jefferson during his arraignment at the Lincoln County Courthouse in Wiscasset on Monday morning. Jonathan D. Roberts, 44, of Waban, Massachusetts, entered the plea in front of Superior Court Justice Daniel Billings. Roberts was operating a motorboat on the lake on Aug. 2, 2018, when the boat struck and killed a swimmer, Kristen A. McKellar, 32, of Camden. Prior to Roberts’ plea, Billings read the indictment. Roberts faces one count each of Class A manslaughter, Class D reckless operation and Class E operating a watercraft at an imprudent speed. Assistant District Attorney Matthew Gerety is prosecuting the case, but was not present in court Monday morning. Instead, the state was represented by Assistant District Attorney Katherine MacRae. Augusta attorney Walter McKee is representing Roberts. Roberts’ arraignment was initiated in front of District Court Judge Barbara Raimondi, but Raimondi declined to preside over the arraignment, saying the case had been given to Billings via special assignment. After a brief adjournment, Billings presided over the arraignment. The Maine Warden Service investigated the incident on Damariscotta Lake and turned its findings over to the Lincoln County district attorney’s office, according to Warden Service spokesman Cpl. John MacDonald. A Lincoln County grand jury indicted Roberts on Jan. 8. A warrant for his arrest was issued Jan. 9 and he was arrested in Massachusetts on Jan. 10. He was freed on $1,500 cash bail after his arrest. His bail conditions include a prohibition of contact with McKellar’s family. After he entered his plea, the state requested that his bail conditions remain the same. The defense did not object to the request. According to the warden service, Roberts and his passengers immediately attempted to help McKellar and bring her to shore. Local emergency medical services continued lifesaving efforts onshore, but McKellar died of her injuries.